Established during the 1850's when Henry Baldwin and Samuel Alexander purchased land near Makawao in order to grow sugar. 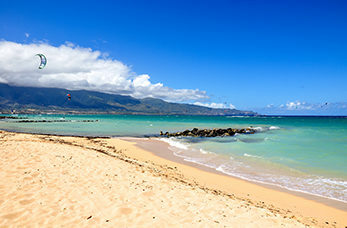 Kahului nicknamed 'Dream City' has grown to be one of Maui's major towns and is known as the shopping capital. Take a journey from sea level to the summit of Maui's massive Haleakala volcano as you travel 10,000 feet to the top which offers spectacular views and you'll be able to explore the beauty of this dormant volcano and its plant life. This museum located in the former mill manager's house in the historic plantation town of Puunene, Maui exhibits the history of the Hawaiian sugar plantations and Alexander & Baldwin's role in the sugar cane industry in Hawaii. This small crescent moon shaped island is a State Marine Life and Bird Conservation District, 3 miles from Maui's coast. It's reef filled waters offer visitors snorkelling and diving amongst more than 250 tropical fish species. The Kahaha Pond State Wildlife Sanctuary was once a royal fishpond, today it's a waterfowl sanctuary home to over fifty species of birds including the Hawaiian Stilt, Hawaiian Coot and Hawaiian Duck plus other bird species.